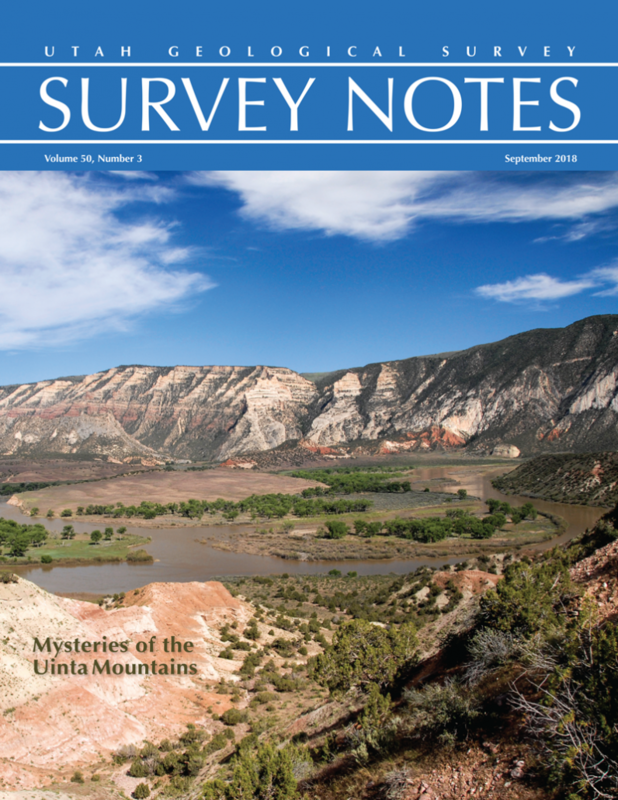 The latest issue of Survey Notes is now available! Learn more about the mysteries of the Uinta Mountains and the ancient volcanoes of the Central Wasatch Range. RIVERDALE, Utah (News4Utah) Some Riverdale homes are closer than ever to falling off the edge of a steep bluff. New measurements taken this week show it’s likely to happen sooner rather than later. SALT LAKE CITY — It may have weighed only 2 1/2 pounds and stood about 6 inches tall, but the discovery of a half mammal, half reptile’s skull in eastern Utah has huge implications for geologic timelines. An overhanging ledge of Permian-age Cedar Mesa Sandstone protects ancestral Puebloan ruins in Road Canyon. The informally named “Fallen Roof” ruin owes its name to the prominent spalling and collapse of thin sandstone slabs from the overhang’s ceiling. Salt Lake City (Nov. 29, 2017) — Oil and gas fields in the Uinta Basin of eastern Utah typically produce about 30 million barrels of oil and 325 billion cubic feet of natural gas annually. The hydrocarbon production also generates over 100 million barrels of saline non-potable water which requires disposal. A new Utah Geological Survey report addresses how to deal with this water. Extensive drilling for gas in “tight” sandstones in the eastern part of the basin generates a need for water disposal, while in the central basin expanding enhanced oil recovery (EOR) programs, called waterflooding, creates a need for water. Although drilling activity is currently low in Utah, and elsewhere, due to depressed oil and gas prices, existing fields continue to produce. As wells mature, water production increases while oil and gas production decreases. In addition, oil and gas prices change depending on the economics of global market supply and demand. History has shown that these prices always rebound. The environmentally sound disposal of produced water affects the economics of the hydrocarbon resource development in the basin. Specific Uinta Basin water issues include water use/reuse for well drilling and completion (e.g., hydraulic fracturing), appropriate sites for disposal/reuse of water, development of systems to manage the produced water streams, and differing challenges for gas versus oil producers. This new study by the Utah Geological Survey (UGS) covers the geology, chemistry, and best practices related to saline water production in the Uinta Basin. 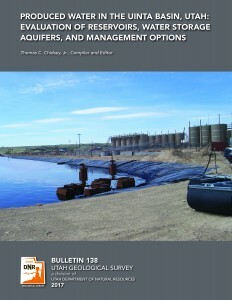 Specifically, it includes (1) descriptions and maps of Uinta Basin reservoirs and aquifers, (2) statistical trends of the basin’s water quality, (3) overviews of produced-water facilities, and (4) recommendations for the best management practices and options to deal with the produced water. Appendices provide complete data compilations either collected or generated as part of this study. The report provides a framework to address the divergent water uses and disposal interests of various stakeholders and will help industry, particularly small producers, and regulators make optimum management decisions. The report also offers sound scientific information to allay public concerns about the potential for drinking-water contamination from hydraulic fracturing and production operations. The 279-page Utah Geological Survey Bulletin 138, Produced Water in the Uinta Basin, Utah: Evaluation of Reservoirs, Water Storage Aquifers, and Management Options, is available (PDF) for free download from the UGS website at geology.utah.gov. Print-on-demand copies are available for purchase from the Utah Department of Natural Resources Map and Bookstore, 1-888-UTAHMAP, www.mapstore.utah.gov. This research was funded by the Research Partnership to Secure Energy for America (RPSEA) through the “Small Producers Program,” authorized by the U.S. Energy Policy Act of 2005, and the National Energy Technology Laboratory of the U.S. Department of Energy, with additional support from the UGS. The UGS also collaborated extensively with sister regulatory agencies within the Utah Department of Natural Resources (Division of Oil, Gas and Mining, Division of Water Rights, Division of Water Resources) and other agencies such as the Utah Division of Environmental Quality, U.S. Bureau of Land Management, and U.S. Environmental Protection Agency, as well as tribal authorities in the Uinta Basin. Participating industry partners were Anadarko Petroleum Corp., EOG Resources, Inc., QEP Resources, Inc., Wind River Resources, and Newfield Exploration. 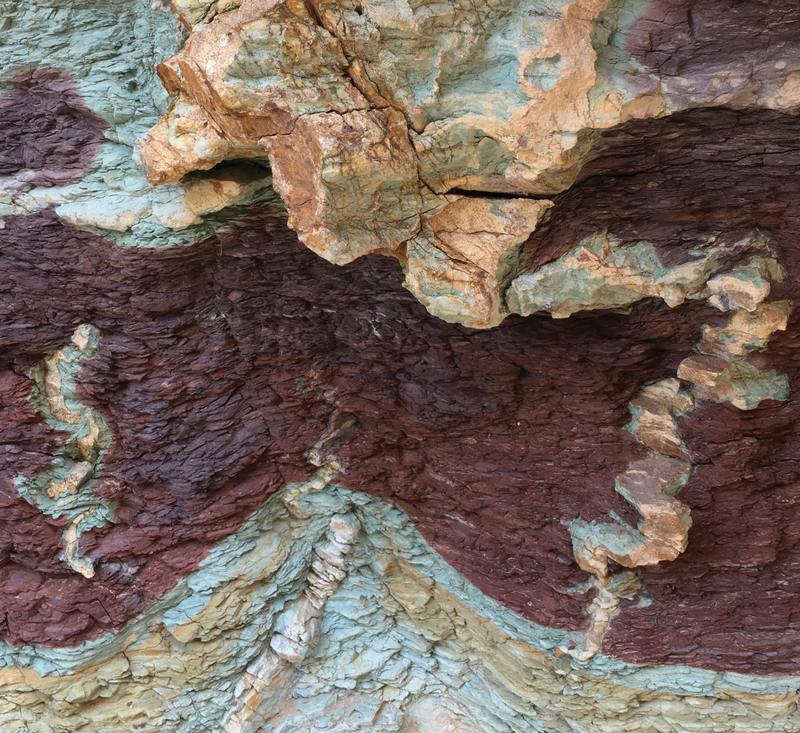 The Utah Geological Survey, a division of the Utah Department of Natural Resources, provides timely scientific information about Utah’s geologic environment, resources, and hazards. While hurricanes were devastating Texas, Florida and Puerto Rico, fires were wreaking havoc in California and other global natural disasters were delivering widespread destruction, some here in Utah expressed relief to live in a place where we do not face such devastating natural hazards. LEHI — Scott Madsen has been working on one particular job for more than 15 years. He’s had a long career as an expert in preparing fossils. His work is exceptionally delicate and he often spends hours at a time peering through a microscope, peeling back layers of rock one layer at a time. 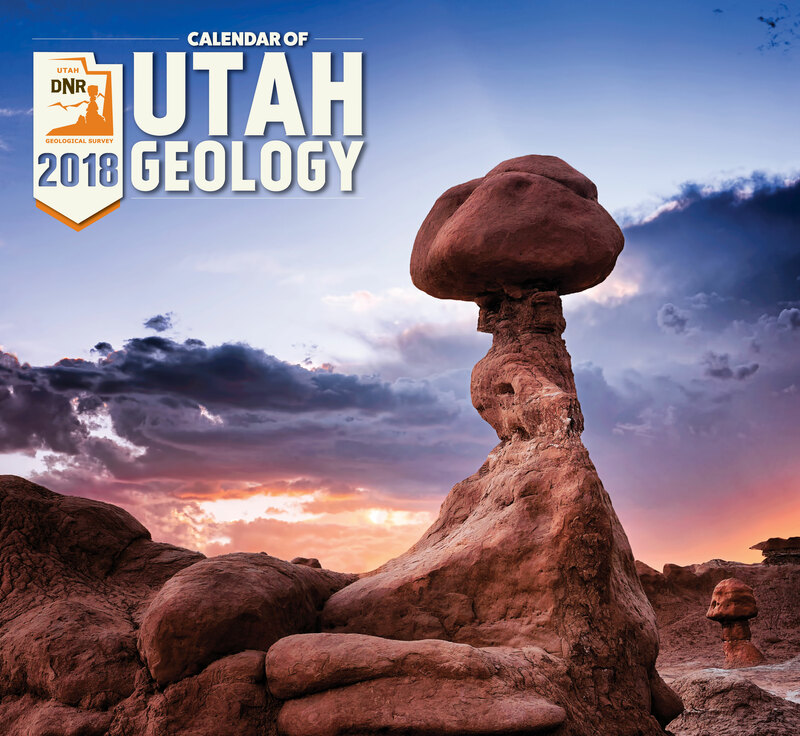 2018 Calendar of Utah Geology is the Best Yet! The Utah Geological Survey (UGS) recently released the 12th edition of its popular Calendar of Utah Geology. 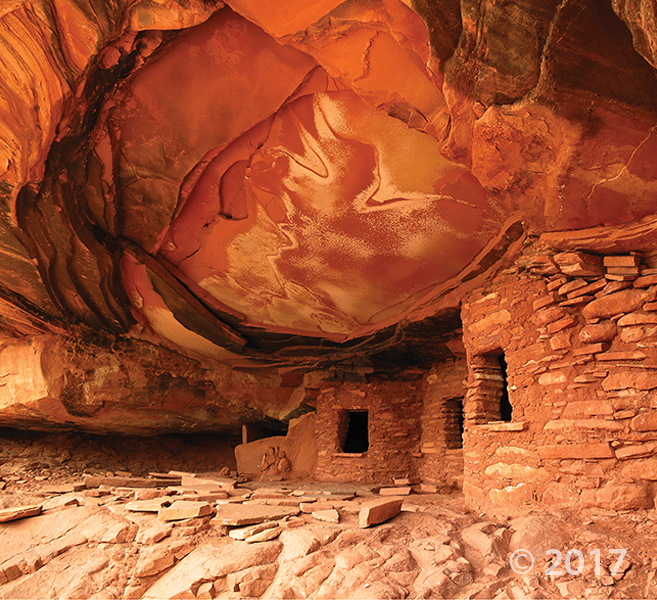 The 2018 calendar features inspiring photographs by UGS staff of Utah’s geologic wonders with a brief explanation of how and when they formed. Weathering and erosion of the Jurassic-age Entrada Sandstone forms a fantastic array of stone structures locally referred to as “goblins.” Goblin Valley State Park, Emery County. Photographed by Gregg Beukelman. Beukelman previously had a passing interest in photography, but it was Utah’s incredible landscapes and vistas that stoked his passion. He now spends many of his off-work hours traveling across Utah searching out vistas and awaiting lighting conditions that allow him to create his stunning images. Like other employees whose photographs have been featured in the calendar, Beukelman’s have transformed from nice landscape shots to true works of art. 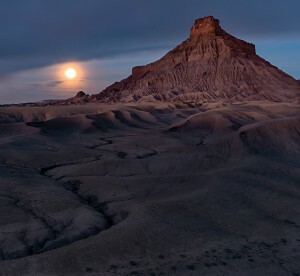 Beukelman is not alone in his path from geology to photography. The calendar has featured more than 40 UGS geologists. Other staff members have taken an opposite tack and were previously artists who sought employment with UGS because of their love of the outdoors and curiosity about geology. UGS graphic designer John Good and Natural Resources Map & Bookstore clerk Andy Cvar are both featured in this year’s calendar. Both the artists who have turned to geology and the geologists who have turned to art have contributed to a tradition of growing excellence to create what proves to be the best Calendar of Utah Geology to date! The 2018 Calendar of Utah Geology is the same price as last year, $4.95 each or $4.25 for orders of 10 or more, and is available at the Natural Resources Map & Bookstore, 1594 West North Temple, Salt Lake City, (801) 537-3320 or 1-888-UTAHMAP. They may also be purchased online. 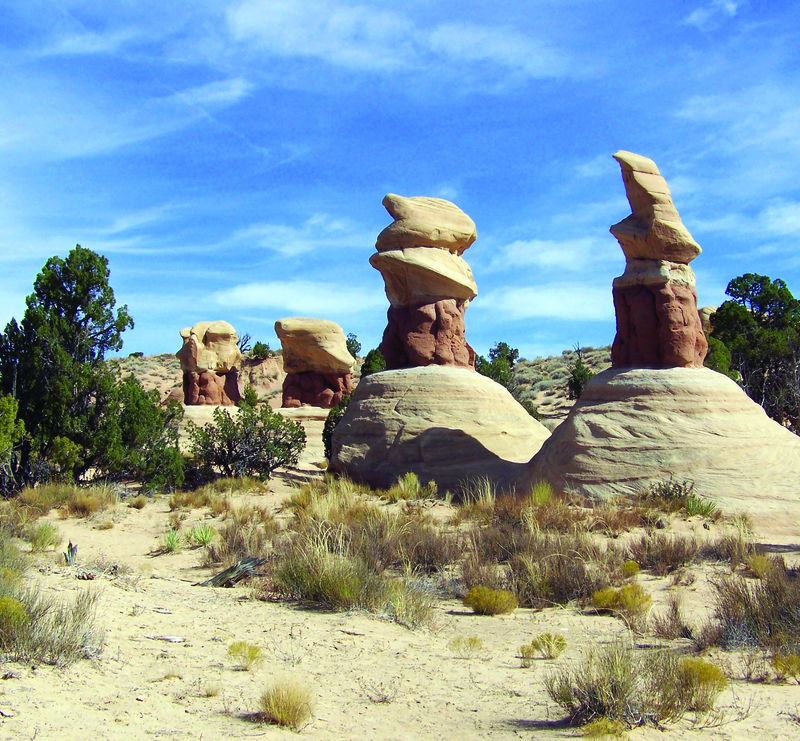 The Utah Geological Survey provides timely scientific information about Utah’s geologic environment, resources, and hazards. It is one of seven divisions within the Utah Department of Natural Resources. The hoodoos of Devils Garden, Grand Staircase–Escalante National Monument, Garfield County. Photographed by John Good. Morning glow and moonset over the Cretaceous-age Mancos Formation of Factory Butte, Wayne County. Photographed by Gregg Beukelman. 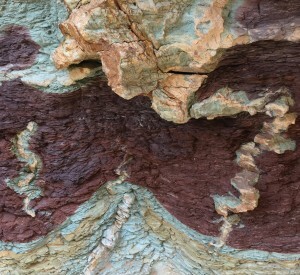 Reduced and oxidized mudstone of the Triassic-age Chinle Formation in the San Rafael Swell, Emery County. Photographed by Natural Resources Map and Bookstore clerk Andy Cvar. Salt Lake City (Sept. 21, 2017) – The Utah Geological Survey (UGS), University of Utah Seismograph Stations (UUSS), and Utah Division of Emergency Management (UDEM) recently published the Utah Earthquakes (1850–2016) and Quaternary Fault Map (UGS Map 277). The new map shows earthquakes within and surrounding Utah from 1850 to 2016, and faults considered to be sources of large earthquakes. The faults shown on the map are considered geologically active, have been sources of large earthquakes (about magnitude 6.5 and greater) during the Quaternary Period (past 2.6 million years), and are the most likely sources of large earthquakes in the future. Most of the small to moderate-sized earthquakes on the map are “background” earthquakes not readily associated with known faults and too small to have triggered surface faulting (under about magnitude 6.5). There is a 57% probability (over 1 in 2 chance) that a magnitude 6.0 or greater earthquake will occur in the Wasatch Front region in the next 50 years. To address this threat, the Utah Earthquake Program (https://ussc.utah.gov/pages/help.php?section=Utah+Earthquake+Program) consisting of the UGS, UUSS, and the UDEM, developed the map so the public could more fully understand the hazard from earthquakes and faults, as well as the resulting risk to property, infrastructure, and life safety in Utah. Users of the map will be able to determine past earthquake locations and relative magnitudes (size), along with the locations of active faults and the timing of their most recent movement. Printed copies of the map are available for $15 at the Utah Department of Natural Resources Map & Bookstore (http://mapstore.utah.gov). The map is also available as a PDF download at https://ugspub.nr.utah.gov/publications/maps/m-277.pdf (44 by 62 inches in size) and can be printed on a wide-format printer.